At the first sign of critters in your Gainesville home, call the family-operated and owned Critter Control®. With over 20 years of experience serving Gainesville and surrounding communities, you can trust that we’ll handle your critter or pest problem addressed in no time. To learn more about what services we can offer you, call us at 352-372-3922. As a licensed and insured animal removal service company, we can quickly and safely remove rodents like mice, squirrels, or rats that have chewed their way into your home, snakes that snuck into your pool or garage, raccoons in your yard, and even armadillos and possums digging under your home. Animals aren’t picky when it comes to finding a warm and safe place to stay, which is why we’re licensed to remove them from your businesses as well. With expensive products, machinery, and the chance to spread disease through mass production, it is crucial you remove any unwanted critters from your corporate building as soon as possible. And since we understand how stressful it can be having unwanted critters in your home, we’ll send one of our expert technicians out to perform a home inspection for no cost. Removing animals from your home is not all we’re trained to do. For your convenience, we can also clean up after any mess a critter has left behind in your home. This includes removing germ-ridden feces, repairing any structural damages, and even replacing all of your attic insulation. And once your home is restored, we’ll use special exclusion methods to ensure you never experience an infestation again. For emergency animal removal in the greater Gainesville area, you can contact our office located at 113 SE 16th Ave. Gainesville, FL 32601, today by filling out an online form or calling 352-372-3922. 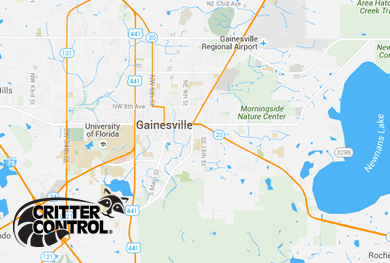 For 24-hour service from experienced professionals, trust Critter Control® Gainesville.